This all but confirms the sedan is dying and has been replaced by the crossover. 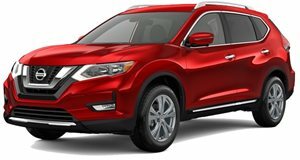 The terms “SUV” and “stagnation” are two that don’t seem to be able to be used in conjunction anytime soon, and following the current trend of larger vehicles outselling sedans, the Nissan Rogue has done anything but stagnate, surpassing the Altima to become the automaker’s best-selling vehicle. This is an important segment for Nissan and competing here is tough, which is why the automaker has eschewed its habit of letting its cars go stale while the competition gets ahead. It did that by refreshing the Rogue and leaving it ready to reenter the marketplace and come out a victor. It's secret weapon, however, has just been revealed and it's all in the pricing. That's because the Rogue has been priced as low as an entry-level sedan, forcing its competitors to reconsider as the automaker becomes among the many to acknowledge that crossovers have fully replaced sedans and must be priced where old sedan owners can afford them. The low price of $21,420 gets you in the driver’s seat of a 2017 Rogue Sport S equipped with front-wheel drive while higher Sport SV and Sport SL trims cost $23,020 and $26,070 respectively. Checking off the all-wheel drive option on the spec sheet adds $1,350 to whichever trim option is selected. Given its striking design, 2.0-liter four-cylinder making 141 horsepower, and seating space for five, the Rogue’s pricing means that it’s poised to gobble up a vast market share when it goes on sale May 11th. What won’t come standard in the price are comfort and convenience features such as leather-appointed seating with the heated front seats, Sirius XM Satellite Radio, a Divide-N-Hide cargo storage system, RearView monitor, Siri, handsfree messaging capabilities, and a navigation system with Nissan Connect. Being 2017, Nissan was also sure to throw in its bundle of semi-autonomous driver aids. These include Around View Monitor, Moving Object Detection, and Intelligent Cruise Control in order to help those who can pony up for the extras better acquaint themselves with what a car of the future will look like. With Honda’s CR-V now on sale and the Mazda CX-5 readying to flood dealerships, Nissan’s answer all but confirms that we’re now in the age of the crossover.